You may have noticed that we have a new logo — well, that's not all. We have been busy this summer working with Sara Rosenstock from justAjar Design Press developing a new identity and branding for all of our events and materials. How did we come to embrace a brand new look for Main Street? A logo identity system was created that encompasses the unique history and streetscape of our town, while also depicting the vibrant energy of our Marietta Main Street partners. Our new, versatile identity system allows all of our events to look like the vibrant, cohesive family that they are — and we couldn't be more excited! Which design elements do the following? 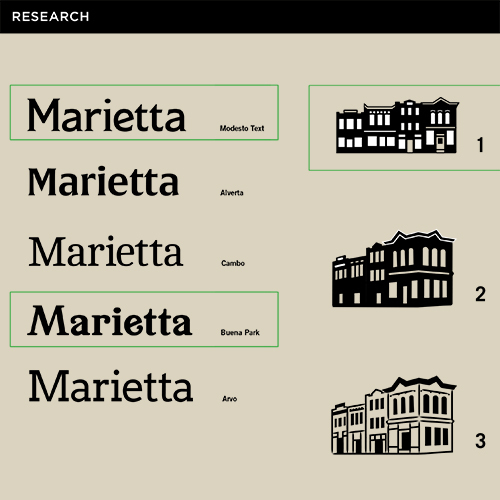 Honor the unique history of Marietta by using historic typefaces that can communicate the personality of the city in a refined, relevant, and approachable manner. Use the unique Marietta streetscape in new logo, but with an illustration that is unique, refined, and discernible at a small size. The highlighted areas in the graphic above show the elements that had the most votes. Through a series of presentations to the Board of Directors, Sara Rosenstock presented several logo options to show a range of solutions that could work for Marietta Main Street. Feedback was garnered from our Board of Directors to help refine the designs into one logo system that would be versatile to use and flexible enough to grow with our organization. The final logo identity system includes designs for every possible application need — ensuring the integrity of brand recognition. In addition to our organization's primary logo, logos were designed for each signature program or event that is hosted through Marietta Main Street — making sure that community members will notice all the amazing things that come through the Marietta Main Street office.